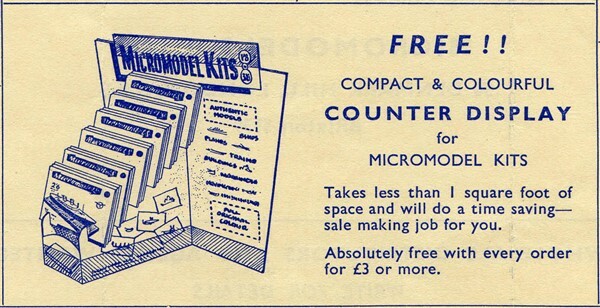 The 1958 Trade order form of Broadway Approvals illustrates a small free standing display stand that was free to any retailer putting in an order for Micromodels of £3.00 or more. These units were designed to stand on a retailer’s shop counter. The stand is made of brown card approximately 2 mm thick and is laminated with the art work. The folds are reinforced by white woven tape. There are 6 slots for Micromodel packets. The design is of the die-cut flat-pack type. The latest model illustrated on the sides is a tram from set TR I issued in 1953. Prices are shown on the header card ranging from 1/8d to 3/6d. Hampton Court Palace was issued in 1954 at 3/6d. 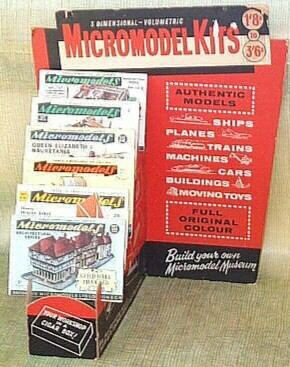 As some Micromodels reached 4/-d in 1955 and later, we can presume that this stand dates from 1954. One Display Stand could be found at the former Cumberland Model and Toy Museum. 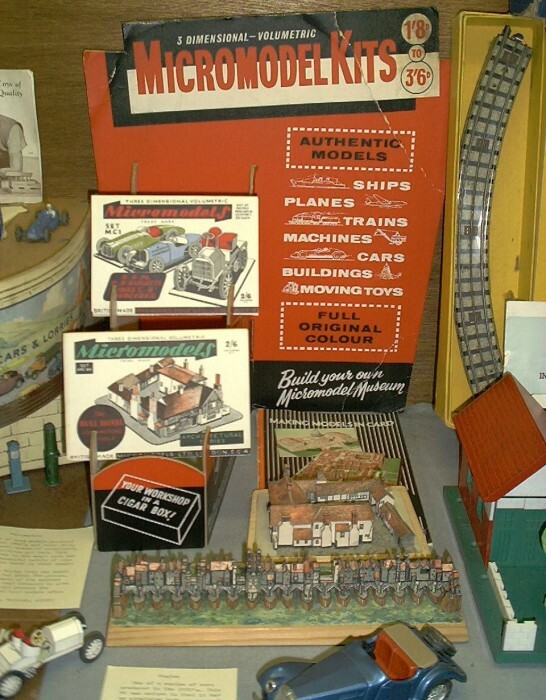 Several mock-ups of much larger display stands exist in the Micromodel archive. These units would have attractively displayed a large selection of packet Micromodels. They were intended to be made of thick card and would have folded up out of a flat pack. It is thought unlikely that any of these larger units reached production status. 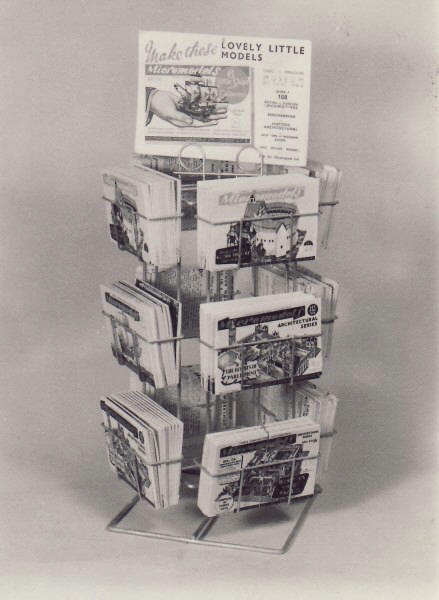 In the late 1950s the Storm Company of Minneapolis designed a wire rack display. These display stands were used by American hobby shops. It can contain 12 stacks of models. On the top a Showcard can be mounted. In this case the showcard contains the packet artwork of Six Little Ships and Galleons.